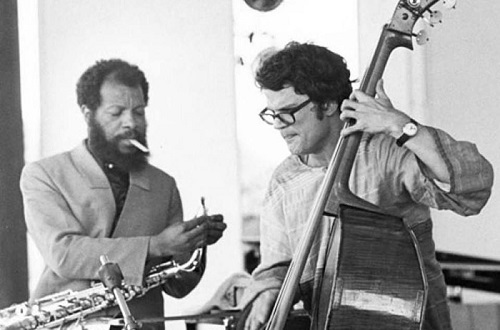 In some ways bassist Charlie Haden was a late bloomer, in other ways he was a prodigy. He was born in Shenandoah, Iowa into a very musical environment. The Haden Family played country and folk music on the radio in the 1940s. At this young age Haden was also a singer, making his radio debut at the age of two. Unfortunately, he contracted a form of polio in 1952, at 15, that affected his throat and facial muscles, which made him unable to sing. Right around that time he attended both a Stan Kenton as well as Charlie Parker concert which sparked an interest in jazz. He started putting all his efforts into the bass at that point, not only because of jazz, but just as importantly the instruments use in Bach compositions. At 15 he was a country musician who was interested in also performing jazz and classical. That is the prodigy part. He decided he needed to be in Los Angeles to pursue a jazz career, in large part as a few musicians he greatly admired were working there. He hadn’t completely left the country music world though as he financed the trip by taking a job as the house bassist for the television program The Ozark Jubilee in Springfield, Missouri while he was still a teenager. He was offered a couple of music scholarships, turning down one at Oberlin College in Ohio to accept one at Westlake College of Music in Los Angeles. It wasn’t til a few years later Oberlin became a jazz mecca for the Midwest part of the country so the decision isn’t as odd at it seems. From 1957 to 1959 he played with Paul Bley, who he made his first recordings with in 1957, as well as Art Pepper and Hampton Hawes, who had been one the musicians he came to Los Angeles to meet. He also became friends with bassists Red Mitchell and Scott LaFaro. How does that make him a late bloomer? Well, Haden during these years was a top sideman. 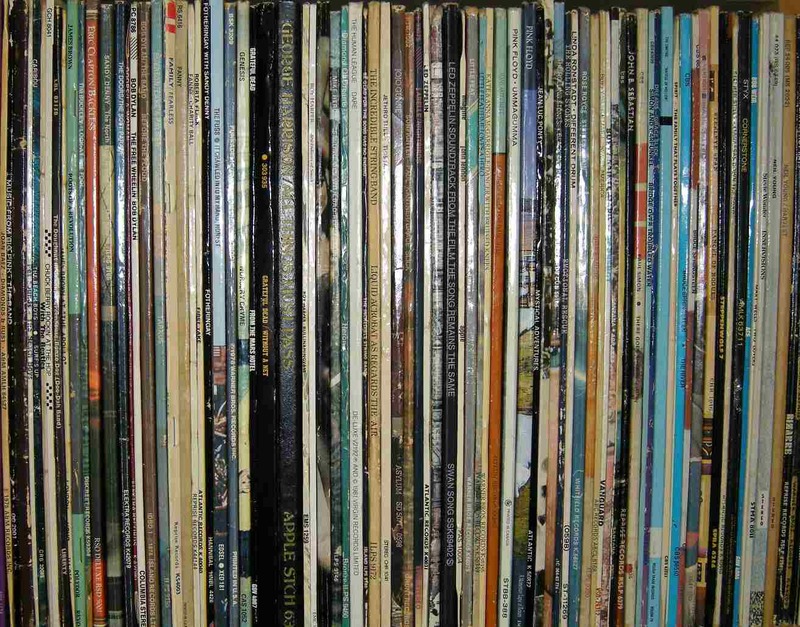 Playing on somewhere around sixty albums between 1957 and 1976 til the age of 39. The only project he led during those years was when the Liberation Music Orchestra (LMO), which he was clearly the leader of, recorded an album in 1969. One of the most important relationships as a sideman was with Ornette Coleman. Haden joined his band not long before they recorded the landmark The Shape Of Jazz To Come. Haden’s playing, which still voiced a lot of Americana influences, blended well with Coleman’s Texas Blues influences. Unfortunately, Haden’s drug use forced him to leave the band for a few years, but he still was the bassist for eleven of the albums Coleman released in the 1960s. His other important relationship was with Keith Jarrett, for whom he played on seventeen albums from 1967 to 1979. His politics were always at the forefront of his art. In 1971 he got thrown in jail before the American Embassy intervened, after he dedicated his Song For Ché to Portuguese colonies while playing in Portugal – at the time the country was a dictatorship that didn’t find that sort of thing funny. Since its beginning, his LMO had existed to make progressive political statements. The handful of albums the group made were often thematic, released because Haden wanted to support a movement or cause. Which brings us to the mid to late 1970s when after twenty amazing years of playing he started releasing albums under his own right. Still, it’s fairly obvious Haden likes to work with partners. The Trio, with Jan Garbarek and Egberto Gismonti, or his group Quartet West bear that out. And so many of the albums released under his own name were duets with other artists. All in all, Haden saw jazz as a “Music of Rebellion” and felt it and he had a responsibility to rebel with his music. On his 2002 LMO release, American Dreams, he wrote “I always dreamed of a world without cruelty and greed, of a humanity with the same creative brilliance of our solar system … This music is dedicated to those who still dream of a society with compassion, deep creative intelligence and a respect for the preciousness of life.” That can be said for most of his music. 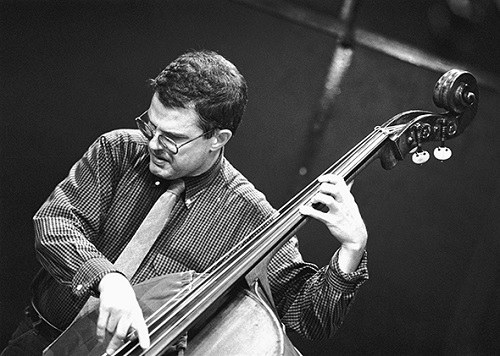 Charlie Haden has an extremely warm tone and an equally subtle vibrato on his double bass. He also obviously envisioned his bass as an equal partner is any band, and certainly improvisation, rather than a backing rhythm section instrument. I loved watching him play as he would close his eyes (something I do that so many find odd) and bend down over his bass in a way I’ve never seen anyone else do. Plus, in the studio, he used a very cool bass which was one of a small number made by a French luthier in the mid 1800s. Haden felt the varnish he used made it an incredible instrument. For me it’s the blending of a folk/country bassist who immersed himself in Bach and avant-garde jazz before he was twenty that created his unique playing and sound. I’ll be listing just songs released under his name, LMO, Quartet West, and a third group called Old And New Dreams. But as I said, there are sixty or so albums before 1976, and probably a similar number as a sideman after that, which are clearly worth a listen. After the first LMO release in 1969, Haden waited until 1976 to release another album with himself as leader. I suppose in some way he still didn’t release an album of his own until 1977, as the two albums with his name on them were duet albums with partner musicians. The third, as a member of the band Old And New Dreams, wasn’t really a solo effort either. But the group, with Haden, Don Cherry, Dewey Redman and Charlie Blackwell was a home run from the first note. Which happened to be played on Haden’s bass during the Ornette Coleman composition, Handwoven. The album’s opening piece allowed all the musicians to shine, and Haden had a nice solo around the four minute mark. The album itself, according to the AllMusic Guide to Jazz, “is fully realized. Quintessential. Modern jazz supreme.” Good stuff. In 1979, Haden released a couple of albums as part of a trio with Jan Garbarek and Egberto Gismonti. Whatever the reason Haden, a Scandinavian saxophone player and a Brazilian guitarist decided to work together isn’t all that important really. What is important is they made some amazing music. Palhaço from the first album, Mágico, has really grown on me over the years. Again, all the musicians in the collective are showcased, with Gismonti playing piano. Haden’s playing on the piece is incredibly subtle to the point you have to strain to understand what he is doing. He truly seems to more enjoy jazz conversations between artists than a more self-centered approach of sharing his own ‘vision’. From the trio’s second album of the year, comes the first Haden composition in the list, For Turiya. It’s much like the first two, a perfect blending of a group of equal partners. It’s perfect how the three of them mesh together. For me, the artistic highpoint of all three of these musicians might be during their collaborations with each other. During this time, Haden was also still recording with Old And New Dreams, and in 1980 they released their third album, which I’m more of a fan than most. Not that it wasn’t well received, just more so than the group’s first two releases which many prefer. I’m especially fond of Playing, which is the title track of the album. It’s another Haden composition, and starts out with a rather lengthy Haden part, which grows and grows, often getting more frantic as it goes. When the horns finally join in at around the two minutes mark it’s somewhat blissful chaos. Perhaps a little odd I enjoy this so much after explaining what I enjoyed about the trio pieces. But such is music. In 1981, Haden released a live album in a duo with pianist Denny Zeitlin. Recorded at San Francisco’s Keystone Corner that summer it was yet another example of Haden enjoying interplay with other artists beyond anything he could do himself. Zeitlin was coming off his commercial peak, having scored the 1978 film Invasion Of The Body Snatchers, but he already had a fairly long career behind him. The album, Time Remembers One Time Once, is excellent star to finish. But the cut Chairman Mao, a Haden composition he recorded in other settings as well, really stands out. You can hear a pin drop. I imagine it was an amazing experience to see the duo live. The 1980s saw some really good work from Charlie Haden, especially with the creation of Quartet West, yet another group he led. But I’d jump ahead a decade to my next composition, and listing the 1990 album from the Liberation Music Orchestra. This version of the orchestra, like the earlier one, strongly involved Carla Bley’s influence. And included the Oakland Youth Chorus, Joe Lovano, Bradford Marsalis, Dewey Redman and others. It won DownBeat’s album of the year as well as being nominated for a Grammy for Best Large Jazz Ensemble Performance. While the opening piece, Dream Keeper, is somewhat staggering in its brilliance. I’m more drawn to the smaller Sandino. It’s yet another Haden composition as well as having inspired playing from every participant. In 1992, Haden released Haunted Heart, my favorite Quartet West album. I remember it was something of a trend at the time, but Haden combined vocals from some singers who had passed on, over his group’s playing on the album. In the case of Cole Porter’s Ev’ry Time We Say Goodbye he used Jeri Southern. And it works. It isn’t overwhelming, in fact the song is about over when you first hear her vocals, but it works. More so, like his other projects, Ernie Watts, Alan Broadbent, and Larance Marable take the center stage just as much as Haden does himself. Haden and Hank Jones recorded two albums of spirituals together, the last in 2012. The first release, Steal Away from 1995, is my favorite. There are several amazing pieces on the album, as Jones’ instincts are very similar to Haden’s. But the interplay between the two on Go Down Moses is incredible, plus we get an understated solo from Haden that makes the piece. Hauntingly beautiful is a pretty cliché statement, but I really can’t think of a better way to describe The Moon Is A Harsh Mistress. The piece appeared on Beyond the Missouri Sky (Short Stories) from 1997, and it was a duet album with Pat Metheny. “The Penguin Guide to Jazz” gave it five stars and has it part of their core collection. This usually suggests it is pretty good. Charlie Haden/Jim Hall was a 2014 posthumous release after the death of both artists. The live concert between Haden and the guitarist Jim Hall came from a show in 1990. And it’s exquisite. There isn’t a misstep in 76 minutes. Not an easy thing at a live event where only two musicians take the stage. And although every song is worth inclusion on this list, Body And Soul is my favorite. Again, Haden found a partner that matched his style amazingly well. But then again it was always Haden who made these sessions, and made whoever he worked with better. Well over a hundred albums as a sideman. And while his discography lists fifty or so albums with him as a leader, there are only two he didn’t release under his group’s name, or as a ‘Charlie Haden with’ title. I don’t know of any other artist, who was unquestionably a leader, who released so little work that didn’t involve a partnership with other artists. I don’t believe he was reticent to work alone as much as he simply enjoyed the give and take of other quality artists. Calvin Rydbom’s latest book is “The Akron Sound: The Heyday Of The Midwest’s Punk Capital” published this year by The History Press. He is the vice-president and archivist of the “Akron Sound” Museum and vice-president of freelance archiving firm Pursue Posterity. He has published a number of music-related articles and was elected to the Society of American Archivists steering committee on recorded sound before being promoted to website liaison. Some of Calvin’s other toppermosts are on the Dead Boys, Rubber City Rebels and Tin Huey all from Ohio. He has also written about several jazz musicians for this website including Charles Mingus, Max Roach and Thelonious Monk. Ballad of the Fallen from 1983 is listed as “Charlie Haden – Carla Bley” and was the only album I had until I found “Liberation Music Orchestra” very recently. Until I read this piece, I knew very little about him. I heard the opening track of Ballad of The Fallen, “Els Segadors” in a record shop, and bought the album on the spot. I can’t say I played the whole album much, but Els Segadors is a great favourite on one of my most played Playlists along with selections from Weather Report and Abdullah Ibrahim. For years, I’ve used two tracks to test hi-fi equipment … “Birdland” and “Els Segadors” as Charlie Haden’s solo bass shows how well a system handles bass.